Rev. Tutu addresses the student body at MLK Convocation. One of the current missions Providence College has been working towards over the past several years has been to build a stronger community by promoting and building on-campus diversity and equality. Working towards this goal, the College celebrated its second annual Rev. Dr. Martin Luther King Jr. Convocation this past Thursday, January 24, featuring Rev. Nontombi Naomi Tutu, daughter of Nobel Peace Prize Winner Archbishop Desmond Tutu. While Tutu’s father is well-known throughout the world for his work and actions in South Africa during apartheid, Tutu has also made a name for herself by working as a human rights activist, coordinating various educational programs about race, gender, and gender-based violence, leading reconciliation workshops for conflicts in areas such as racism and violence, leading women’s retreats, and writing her own book provisionally titled I Don’t Think of You as Black: Honest Conversations on Race and Racism. Tutu began her speech with great enthusiasm, automatically engaging and awakening her audience by having them respond and laugh along to her greeting, acknowledging the difficulty those who presented her had with pronouncing her name. 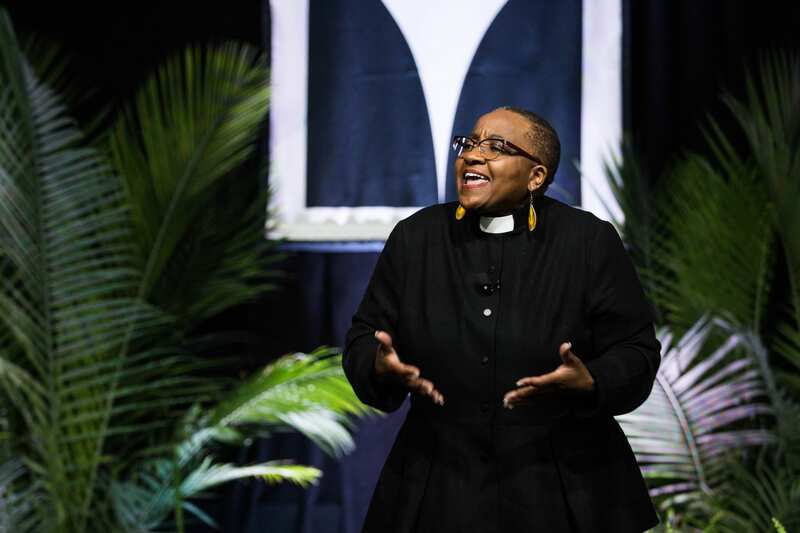 Her speech focused on building “the road to a beloved community,” a recurring theme throughout PC’s week of events held in honor of Martin Luther King Jr. Day. One of the things Tutu strongly emphasized in her speech was the idea of taking a stand for what one believes in and acting to make a change. She used her own experiences growing up in South Africa during apartheid as examples of how she personally did this. She said that from a young age she was taught to “show resistance as you can, when you can,” which she always did by giving white authority members a little bit of attitude. She used this story to encourage her audience to take a step back and consider whether there may be another story behind one’s initial thinking. While Tutu knows stepping outside of one’s comfort zone may be difficult, she encouraged her audience, especially the students, to step outside their comfort zones to discover the truth about others. Tutu’s encouragement to strive for the truth related personally to her PC audience, as searching for the truth, or Veritas, is one of the founding ideas surrounding the Dominican tradition PC is built upon. As the PC website states, “[Veritas] seeks to share the fruits of contemplation in an increasingly global and diverse society, and to praise and bless all that is good and vital in human endeavors,” which is similar to what Tutu called her audience to do everyday. Before Tutu’s speech, the convocation began with several introductory addresses by members of the College community, including Dr. Hugh F. Lena, provost and senior vice president for academic affairs, Rev. Peter Martyr Yungwirth, O.P., Rev. Brian J. Shanley, O.P., Ralph E. Tavares ’01, director of multicultural student success and assistant dean of undergraduate studies, and Marvin Taveras ’19. During these introductions, Shanley also awarded Jillian Rose ’04, current director of community engagement, diversity, and research at the Hospital for Special Surgery in New York City, the second MLK Vision Award for her various works in helping improve the lives of medical patients of color. Each of these speakers, Tutu included, strongly encouraged not only PC students, but the entire PC community, to understand the importance of God and faith in creating a beloved community. In Fr. Peter Martyr’s invocation prayer, he asked God to make all those present instruments of change and healing in the world. Tutu emphasized this while discussing her father, who, she explained, would go out tirelessly and advocate for change. Rather than getting discouraged in his lack of progress, Tutu explained that her father would respond to this, saying, “I believe that the God I serve is a God who keeps going back to his people over and over,” giving him the strength to continue in his efforts and work. One of the largest takeaways those who spoke wanted to impress on those in attendance at not only convocation, but all of the MLK events throughout the week, was the idea of continuously working and reaching out to others, just as Tutu’s father did and Tutu herself does, in order to promote a stronger diverse community at PC.